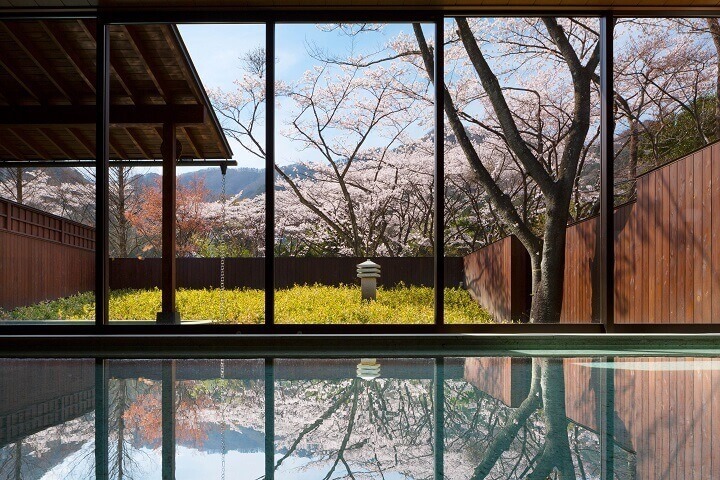 5 Hotels & Ryokan to Enjoy Cherry Blossoms: From Inside Your Room to Inside a Hot Spring! At last the warm rays of spring are gradually trickling through, and already the news is rolling in for the cherry blossoms in Japan. If you’re in Japan this spring, then take a look at some of these great hotel plans you can look forward where you too can enjoy Japan’s pink season. 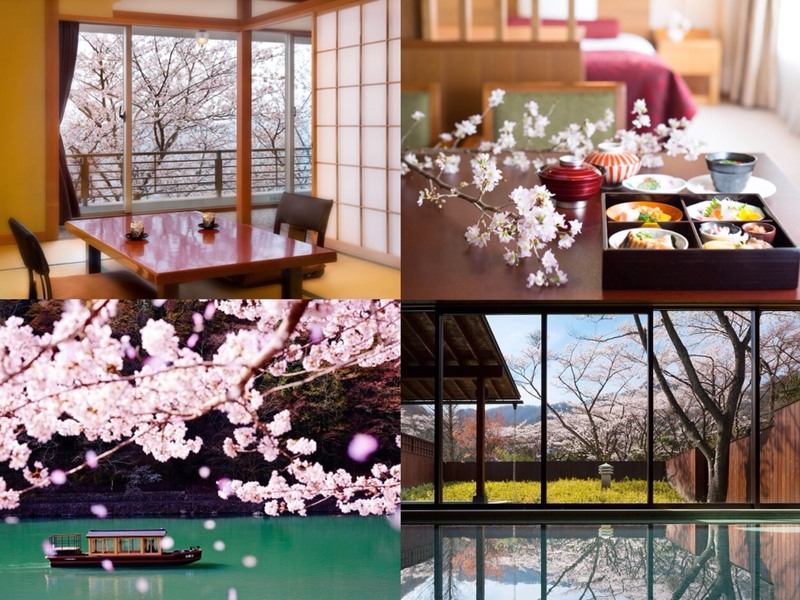 HOSHINOYA Kyoto, the luxurious resort operated by Hoshino Resorts where every room has a view of the river, is holding four exciting activities for hanami, the traditional Japanese custom of flower viewing. The activities are themed on a hanami sojourn deep in Arashiyama. 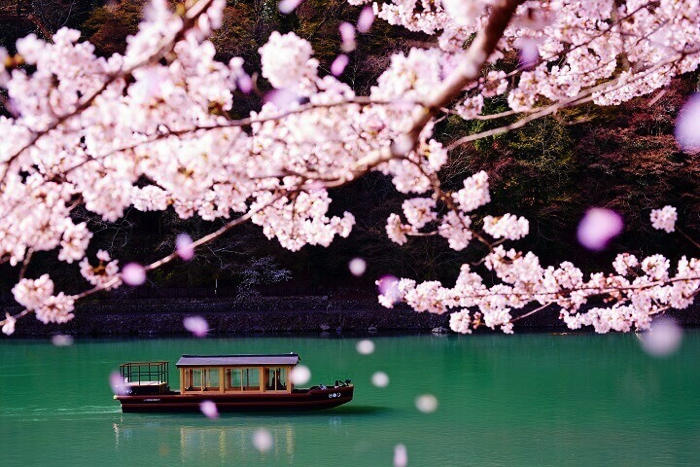 Activities include Sakura Fune (Cherry Blossom Boat), where you can enjoy hanami from a boat; the Sakura Chakai (Cherry Blossom Tea Party) where you will be seated in view of the mountain’s cherry blossoms; and Yozakura Dinner (Evening Cherry Blossom Dinner) where you can enjoy a meal amongst the lit-up cherry blossoms. Each activity offers an engaging hanami experience courtesy of Arashiyama’s spectacular cherry blossom scenery. Kichijo CAREN is a place where you can enjoy many kinds of cherry blossoms while inside a hot spring. The view from “Izu Kitagawa Onsen Moon Road” which was chosen as one of Japan’s 100 famous views is absolutely gorgeous. Enjoy a romantic view from either the guest room or hot spring. For a limited time only, you can relish in a special hotel plan and get your fill of cherry blossoms, Japan’s signal flower for spring. 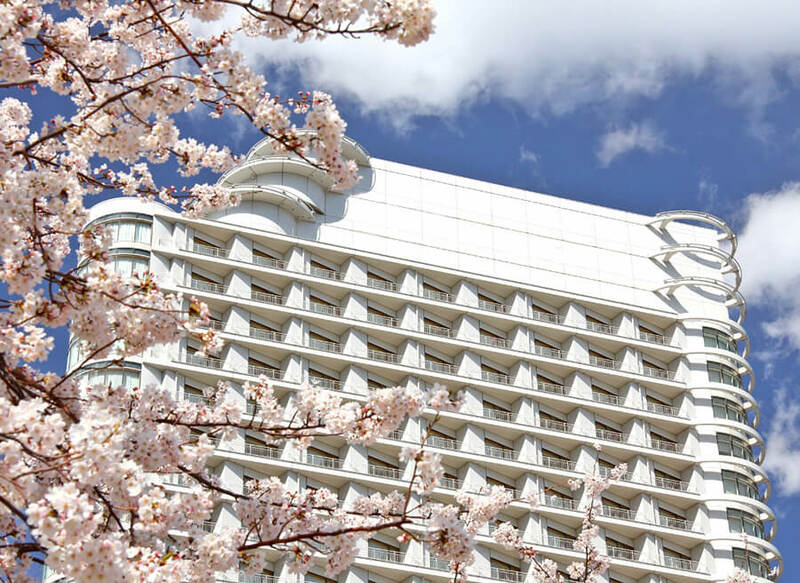 Gaze at the rows of cherry trees while feeling the sea breeze against your cheeks from your room balcony and enjoy a hanami experience the Yokohama Bay Hotel Tokyu way. ※The price noted above is the price per person when using the twin room. Lunch course and cherry blossom sweets item will be offered at the Chinese restaurant Turandot Yusenkyo” (3rdfloor) on the day that you are leaving the hotel. ※dessert buffet (weekdays) and cherry blossom dessert plate (Saturday and Sunday) will be offered. ➁ Cherry blossom cocktail will be offered before eating the lunch menu. This hotel is offering a special one-day stay plan where guests can stay in a suite decorated entirely in cherry blossom artwork and décor. Everywhere from the entrance to the living room and bedroom is dotted with cherry blossoms, enabling you to experience Japanese hanami from inside your room. The hotel’s café/restaurant Camelia also sells sweet cherry blossom bread. Kinugawa River in Tochigi Prefecture is about a 2-hour train or car journey from Tokyo. It’s immensely popular as an onsen, or “hot spring” site, and is close to World Heritage Sites and places of scenic beauty. 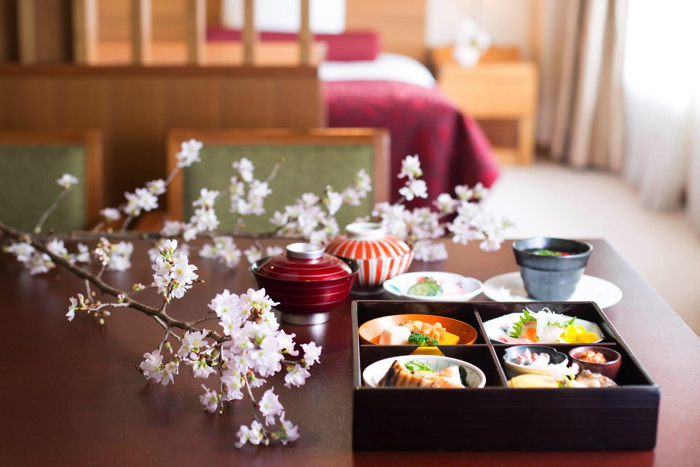 The KAI Kinugawa hot spring resort at Kinugawa Onsen is offering a limited-time “Yozakura Dining” plan from April 11th to April 20th. 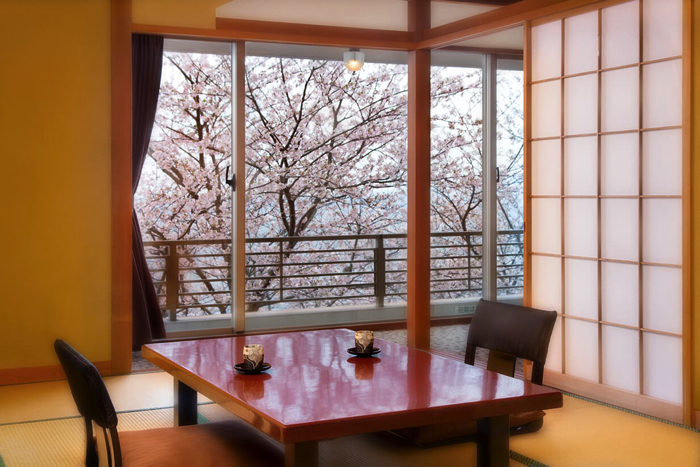 For one night, two people can enjoy a banquet while gazing at the cherry blossom trees in the evening. You can also experience “Hanami Roten” and admire the cherry blossoms in full bloom from the site’s famous open air hot springs. Spring is coming, so be sure to use this list on your holiday trip this year.